In searching for a job in Australia, your goal is to catch the eye of the hiring manager once they get to your resume. 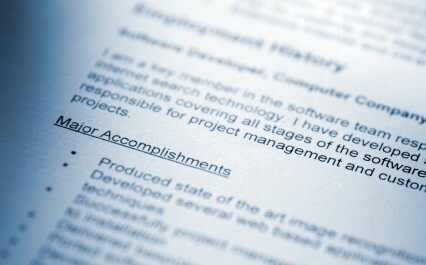 Here are five resume tips to help you achieve this. The key is to keep their attention for longer than five seconds. And to achieve this, your resume must be dressed to impress. Just like a good business suit, there are certain words that convey power and confidence that you can weave into your resume sections on skills, work history and achievements to make sure your resume stands out. 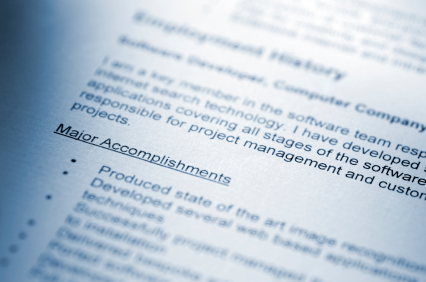 Let’s take a look at a few resume tips. We see many people seeking work in Australia often weaken their skills and experiences with verbs that miss the truth of what they’re truly capable of, such as words like ‘assisted’, ‘helped’ and ‘supported’. The worst word to start a bullet in your resume is ‘responsible for’. People tend to do this when talk about themselves as part of a team working on a project. However, the truth may be that the you single-handedly ‘spearheaded’ a project that generated significant profit for their company. It’s always best to use phrases that accurately represent your level of involvement in a project. Otherwise you will be selling yourself short to the hiring manager. Remember to quantify the value you made in your past roles. This is vital in demonstrating the impact you can bring to the next organisation that is considering hiring you. For example, instead of saying that you ‘managed a team’, mention the number of people you managed too, i.e. ‘Led a team of six technical support analysts to deliver 10 major IT implementation projects for clients such as HP between June 2016-December 2016′. If you cannot quantify your work accurately, describe your work by showing the value you brought to a company. Identify ways you made operations run better, faster, cheaper, more smoothly, more profitably or safer. Phrases like ‘exceeded quota’, ‘under budget’ or ‘on time’ really help to demonstrate your value. At the end of the day, you’re trying to demonstrate to an organisation that you’re a great fit for a role. Therefore, it’s wise to align your experiences with the job description of the job you are applying for. Identify key phrases used in the job description and on the company’s website to add the right type of detail to your resume. By using the language that is in the job advertisement, the hiring manager will favour your resume over others. Make sure you use distinct verbs to illustrate the responsibilities you held and the accomplishments you achieved in a role. However, some verbs are better than others. Tired verbs such as ‘actioned’, ‘handled’, and ‘assisted’ can be detrimental to accurately showing what you can do. Yet verbs such as ‘achieved’, ‘created’, ‘improved’, ‘launched’ and ‘trained’ can help to portray you as powerful and confident. Need to discuss your resume further? For a free consultation, get in touch now. Hello.Im Bhavana from India,Bangalore.I have completed BE in Electronics and Communication in 2016.Im in need of a job in Australia.Please help me out to find a job over there.Thanks in advance. My name is Shabana Ismail citizen of South Africa. I am keen in relocating to Australia and securing job is quiet the challenging reality. My experience includes Accounting and External Auditing with relevant qualifications, registered with an accounting professional body ACCA, together with my degree and post graduate diplomah in accounting. Currently I am pursuing my master in Accounting. Kindly guide me upon my job opportunities. As I am in the process regarding my immigration. Hi Shabana, thanks for your post! Have you lodged your PR application yet? The process can take some time. The other thing to look at is CPA. It’s best to do market research on SEEK for accounting/audit positions to see what the requirements are. i.e. do 70% of the jobs ask for MYOB or XERO? What are the common/key skills/requirements that they are asking for – and do you have them? Feel free to use the contact form on the ACECIS website to send us your resume so we can provide feedback and strategies to get into the job market in Australia. Hi Naren I am Senior Energy Engineer with 6+ years of experience in handling projects related to Energy Monitoring, Energy Audits in Asia and Africa. I am waiting for the 189 PR visa grant and expecting it to be granted in couple of months. Kindly suggest how can I tailor my CV and cover letter and also how you can introduce me to the respective companies. Also how much do you charge for the services you offer and various packages offered. Thanks for the post. Wonderful to hear that you’ll be receiving your PR soon. I understand you will have to make your first entry at some stage. This is a good opportunity to explore the market when you arrive, meet up with recruiters and network with other professionals in similar roles to you to gather intel on strategies to get interviews. We suggest starting the process of updating your resume, CL and LinkedIn profile at least 3 months before you arrive. This will allow you to start applying for jobs the minute you land. Can you please use the contact form on the ACECIS website to send us a copy of your resume so we can assess it and advise you on what needs to change? On another note, please start doing research on SEEK, Indeed and Adzuna on positions that match your profile. Also start thinking about which city is a good match to you (friends/family/jobs). Finally, work out a budget…i.e. if you can’t get a job in say 6 months, how much do you need i.e. 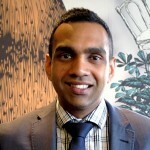 $2,000 or $3,000 AUD each month to manage expenses until you gain employment. All the best with your relocation to Australia.